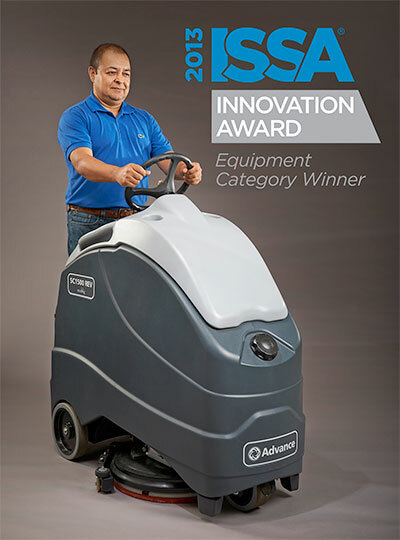 The Advance SC1500TM REVTM stand-on scrubber has been named the equipment category winner of the 2013 ISSA Innovation Awards. ISSA, the Worldwide Cleaning Industry Association, announced the award during the ISSA / INTERCLEAN&#reg; North America conference in Las Vegas, NV. The award marks the second time in the past three years that Advance has been recognized, this year besting eight other entries in the equipment innovation category. "Our goal for the SC1500 was to create the best stand-on scrubber in the business, and the ISSA Innovation Award affirms our ambitions," said Jeff Barna, President and General Manager of Nilfisk-Advance U.S. "We are pleased and honored that our customers and the cleaning industry have once again validated our continued commitment to superior product design and cleaning technology innovation." The annual ISSA Innovation Award program gives the professional cleaning industry an opportunity to recognize the most innovative products and services in five categories: cleaning agents, dispensers, equipment, services and technology, and supplies. Online voting at ISSA.com is open to cleaning-industry distributors, wholesalers, building service contractors, and in-house service professionals. Members have the option to vote for one product in each category. The much-anticipated Advance SC1500 stand-on scrubber, formally introduced in June, 2013, has gained widespread industry attention with an array of advanced features that satisfy both daily and deep scrubbing applications. The compact, easily maneuverable design offers up to three times the cleaning productivity of other stand-on scrubbers, featuring up to 3.5-hours of battery runtime and faster operating speeds that deliver up to 109 minutes of cleaning per tankful. The award-winning, 20-inch SC1500 REV model features Advance's patent-pending, random orbital scrubbing technology that provides superior daily scrubbing performance as well as deep scrubbing for chemical-free finish removal in a single pass. The SC1500 REV is the first stand-on automatic scrubber that cleans floors with distinct, random orbital and rotational motion, delivering a uniform, non-swirled floor surface ready for restoration while using far less water and chemicals. Advance is a brand of Nilfisk-Advance, Inc. For more information on the new Advance SC1500 call 800-850-5559.